SASO’s new season: from Russia’s steppes to America’s Wild West! From Russian steppes to American cowboy country, the music chosen for St Albans Symphony Orchestra’s 2017-18 season travels from East to West and back again. The journey begins on Saturday 14 October with an all-Russian programme chosen by the St Cecilia Festival Society for its biennial concert in St Albans Cathedral when the orchestra teams-up with Harpenden’s Hardynge Choir, the Radlett Choral Society and St Albans Chamber Choir. Directed by Chamber Choir conductor John Gibbons, the featured work is Rachmaninoff’s thrilling choral symphony The Bells. But there will also be rare chances to hear choral versions of the 1812 Overture by Tchaikovsky and the Polovtsian Dances by Borodin. ‘Animal Magic’ is promised for the orchestra’s two annual children’s concerts, in St Saviour’s Church on Sunday 19 November when the musical menagerie includes the comic Three Bears Phantasy by Coates. There will – by tradition – be (optional) fancy dress as well as a chance for children to try out the players’ instruments. For this and remaining concerts in the season, Principal Conductor Tom Hammond takes charge of proceedings. On Monday 1 January 2018 , the orchestra returns to the Abbey for its traditional New Year Concert, combining American classics with British light music favourites. Music from Copland’s ‘Wild West’ ballet Rodeo and Gershwin’s American in Paris will be followed by Arnold’s Scottish Dances, Farnon’s Westminster Waltz and the maypole dance Barwick Green by Wood, known to millions of radio fans as The Archers theme. In St Saviour’s Church on Saturday 10 March the orchestra performs the Czech composer Dvorak’s Symphony No 7 and Serenade for Winds, while the concert on Saturday 12 May moves back to Russia. Renowned St Albans-based pianist Alissa Firsova will be the soloist in Tchaikovsky’s monumental Piano Concerto No 1, followed by music from Stravinsky’s first great ballet The Firebird. The season concludes in St Saviour’s on Saturday 23 June with a programme entirely given-over to the music of Sibelius. 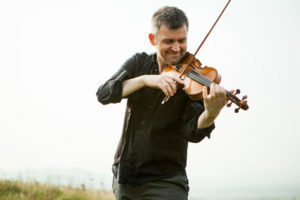 Violinist David le Page, acclaimed for his Tchaikovsky performance last season, return in the great Finnish composer’s only concerto, with the Symphony No 5 and tone poem Finlandia also featured. Click here for ticket information and further details of SASO’s 2017-18 season.